If you have been reading this site for very long, you know that I’m a bit partial to historical aviation and old airplanes. I’m type rated in the B-747-400 and the A-330 an have flown a Jenny and a lot of airplanes in between. For the sheer pleasure of flying, you cannot beat the wind-in-wires experience of an antique biplane… Just in case you wonder why I link to lot of historical aviation articles. This article is from the Sidney Herald – in Montana. Sidney is apparently celebrating their centennial. 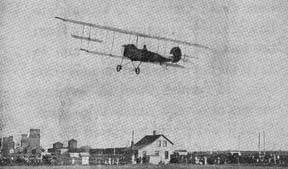 The article relates the town’s aviation history – starting with the first appearance of an airplane in the town in 1915 when it made several passes along the main street in town. This article is from the Springfield News-Sun. The EAA Ford Trimotor is going to make a stop on it’s tour this summer at Grimes Field, Urbana, IL. Here’s a little more information about Grimes Field. This article is from the Park Rapids Enterprise, a suburb of Minneapolis. Noel Allard was recently inducted into the Minnesota Aviation Hall of Fame and this article explains a little of his background. If you are into aviation history, the article can lead you to all sorts of other subjects – like Hamilton Metalplane, ‘Speed’ Holman, Wold-Chamberlain Field (Ernest Wold and Cyrus Chamberlain). A town in Connecticut celebrates 100 years of flight. This article is from The Plainville Citizen. the first flight of an airplane in Plainville, CT (SW of Hartford) occurred in May of 1911. The City and Robertson Airport (4B8) are celebrating the event tomorrow. This article is from the Mukilteo Beacon. The Washington Pilots Association and Paine Field (KPAE) are hosting a General Aviation Day tomorrow. A lot of things will be going on at the airport, including the season’s first ‘Fly Day’ for the Flying Heritage Collection – a flying museum of perfectly restored aircraft. If you are in the area it will be well worth your time to make it to this one. this is a segment from The Aviators. The link takes you to the AOPA Live site with access to some of their other videos. It always fascinates me how many airline pilots relax by flying open cockpit aircraft at the end of a long tour. There is no more fun than flying a Piper Cub with the side window open, the door down and a crisp, clear day as you tool around looking at the countryside. Yeah, it’s nice to keep things simple and still be able to enjoy the ride. No passenger or crew hassles, just fun flying. "The Cub is the safest airplane in the world; it can just barely kill you."